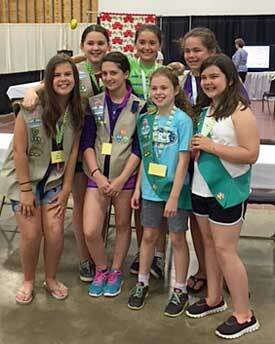 Girl Scout Troop #776 volunteers for the Fun with Fabric project. Organizer Celia Middleton is standing, top row, left. 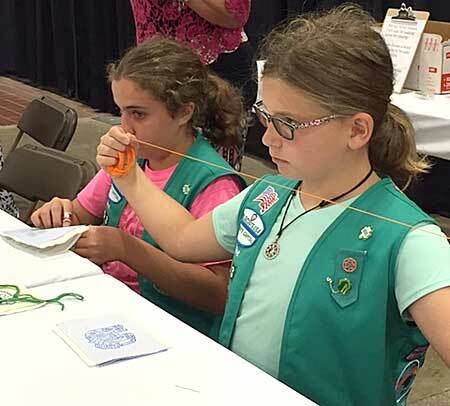 My niece Celia Middleton from Girl Scout Troop #776 recently organized a free* quilting educational activity for her Girl Scout Silver Award, and I was proud to support her as a sponsor! Celia’s Fun with Fabric – Make Your Own Mini Quilt activity took place on Sunday, May 31 at the 42nd Annual Quilter’s Unlimited Quilt Show in Chantilly, VA.
She developed this project so that participants began with creating a stamped fabric with wooden printing blocks, added batting and backing and then completed the “quiltlet” by hand stitching, which kept the three layers together. 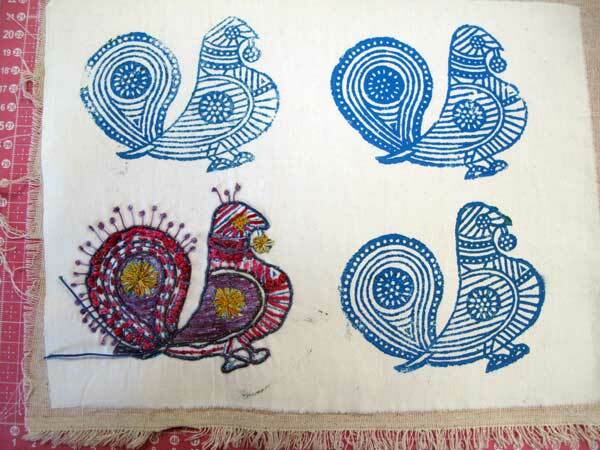 These little pieces of fiber art thus illustrated what a quilt is. This event was open to all ages, and all ages participated! Celia had to organize and administer this project on her own, including documenting her hours of work related to the project, to begin achieving the levels needed to qualify for her Silver Award. Advance work included an initial meeting with a quilt show representative, lots of practice of the techniques needed so that the steps could be taught, creating samples for display, developing signage and information/illustration boards (pictured above), preparing the supplies of fabric, batting, needles and thread (donated by Artistic Artifacts) and training her helpers, which included her younger sister, Layla. 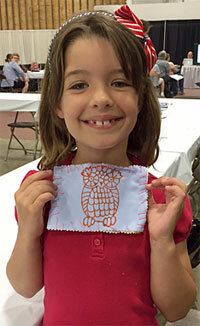 The pride of learning new creative skills shows as this young participant displays her finished quiltlet. 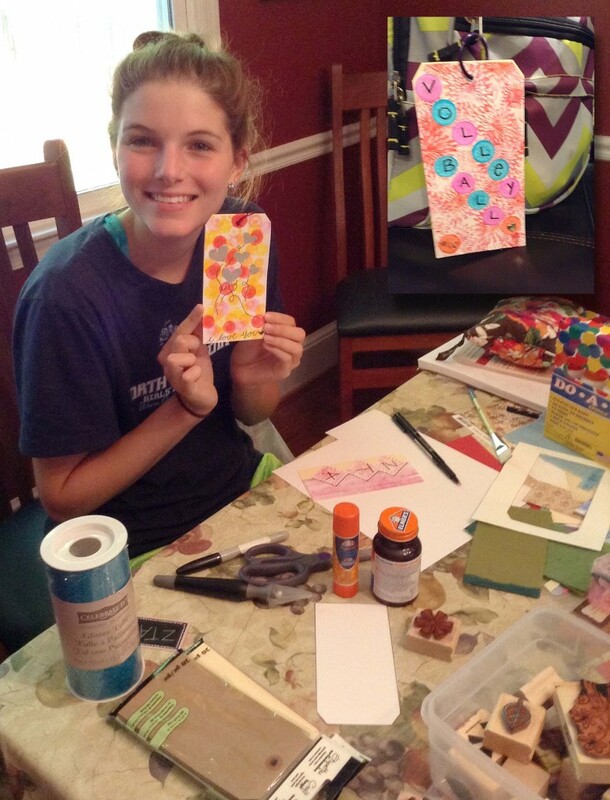 In addition to this educational activity, Celia is planning to make quilts and donate them to charity as part of her Silver Award project. 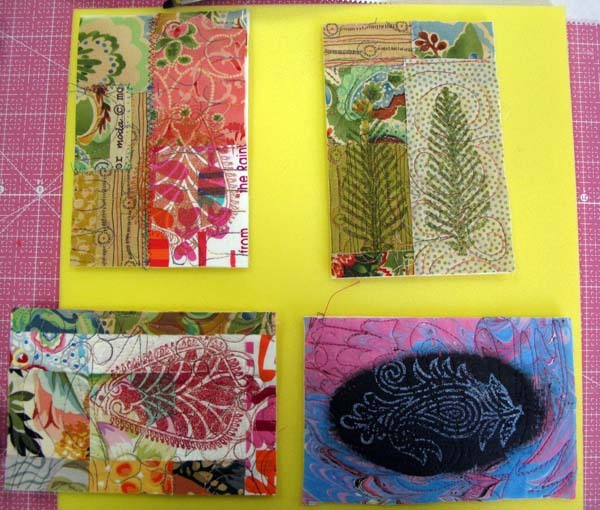 She asked participants to donate wood block printed squares to be used in these quilts that she will sew. Celia also hosted a fundraiser for the Girl Scout Council of the Nation’s Capital SHARE program. 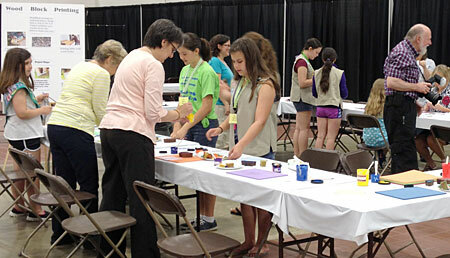 The SHARE (Share Her Annual Real Expenses) program helps pay for membership fees, camp and other Girl Scout activities. Celia collected $20 in donations from workshop participants and is planning to continue collecting donations for this worthwhile cause! Ellen West and her committee co-chair Carla Lounsbury of the Annandale chapter of Quilter’s Unlimited were our quilt show liaisons and created a great space for the project. I hope you enjoy the photographs included here of the girls in action. 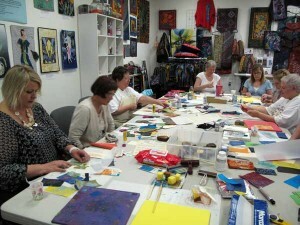 I know they enjoyed welcoming many participants and teaching them the joys of quilting! The Girl Scouts and Boy Scouts who arrived wearing their uniforms on that Sunday were admitted to the show at no charge. 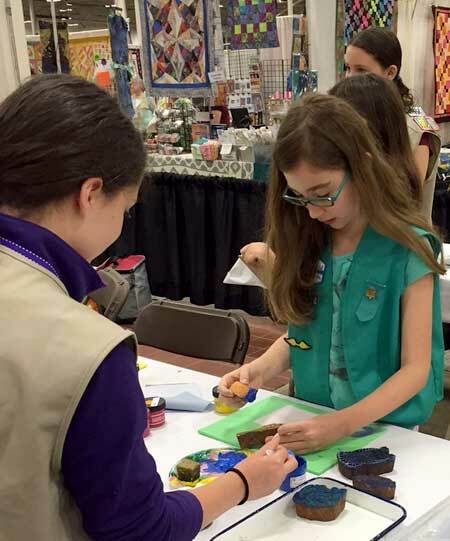 We hope that the quilt show admin will consider allowing the Scouts in uniform free for all 3 days of the show. It is so important to encourage a love of traditional arts such as quilting in the next generation, and demonstrations like Celia’s and programs such as free or reduced admission to shows and events are steps to achieving that goal. 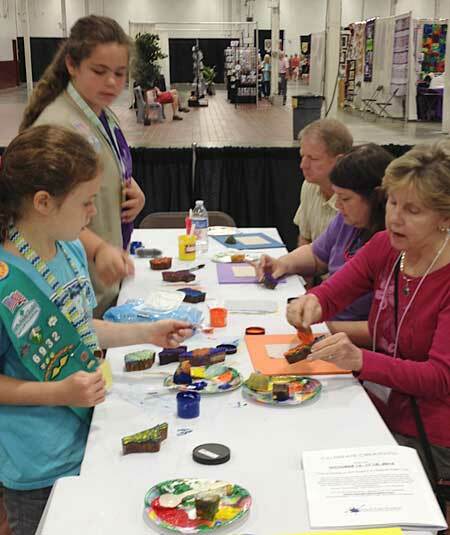 Girl Scout volunteers block printing. That's the Artistic Artifacts/Batik Tambal booth in the background. I had a birds-eye view of the action in the demonstration area! * Donations were accepted for the Girl Scout Council of the Nation’s Capital SHARE family giving campaign. Hi Judy, finally got the Australian Quilt done and wanted to send you pictures of it. You wanted to see the end result. I also refinished all my pillowcases to match the quilt. 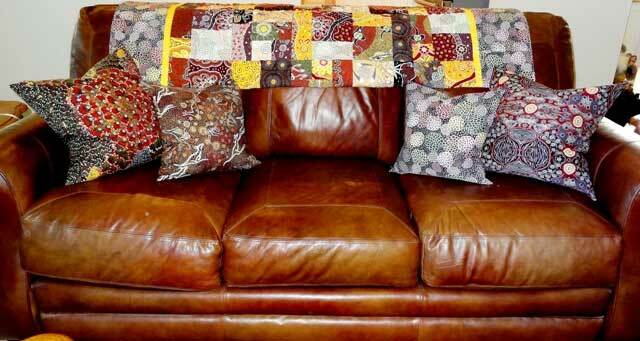 It all goes well with the leather sofa and chairs. The quilt pattern is the simple “Yellow Brick Road” Pattern, which has been around for a while. Also used bamboo batting to make it nice and soft. Love the fabrics and have enough left to make a table runner! 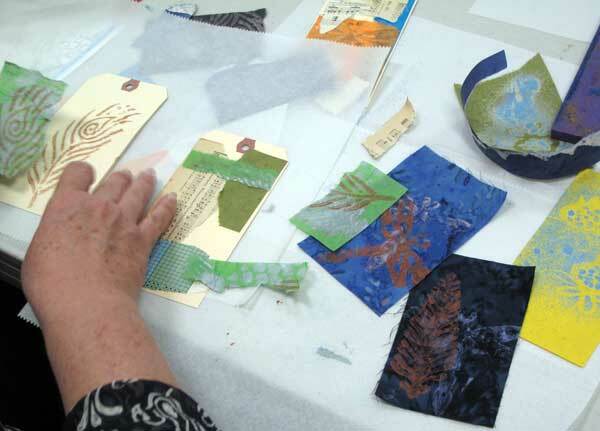 Also, we held a fun tag class on Saturday, June 14, Words of Wisdom: a Little Book of Design Inspiration with Diane Herbort. Ann Douglas was one of the students enjoying the day. 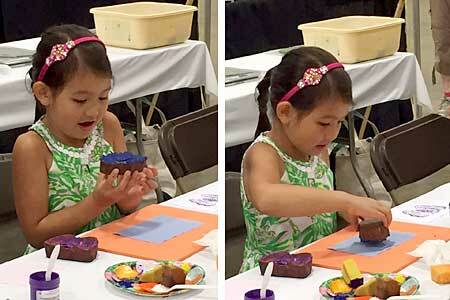 Her beautiful granddaugher was unable to join us in the class, but afterwards enjoyed a craft day with Grandma! 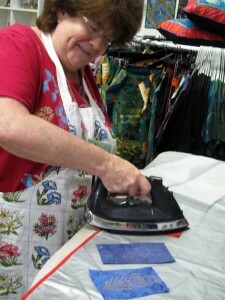 On June 12 we hosted our monthly “How Do I Use This?” product demonstration and hands-on play. The subject this month was using DeColourant and DeColourant Plus. These products work on dyed natural fabrics, such as cotton, rayon, or linen, as well as on many papers. 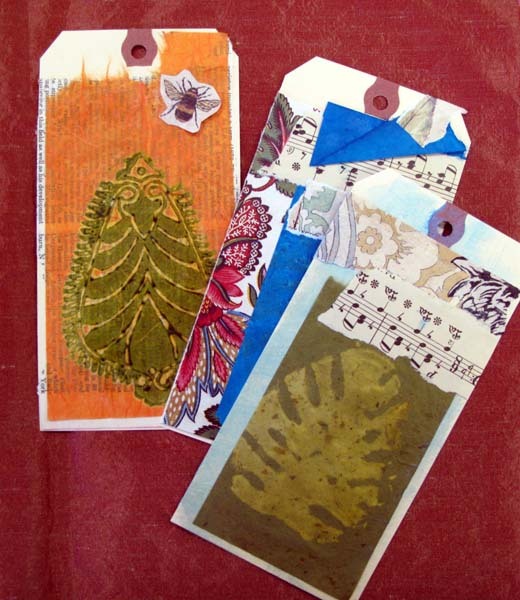 We stamped and applied deColourant (removes color) and deColourant Plus (no longer available, it removed color while adding a new color pigment) on fabric swatches and on handmade paper. I have used DeColorant on fabric many times, but I had never tried it on handmade paper. 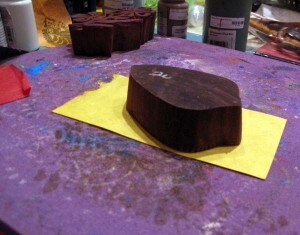 Pour a small amount of deColourant onto a plate or pallette, then use a sponge apply it to the wooden printing block. 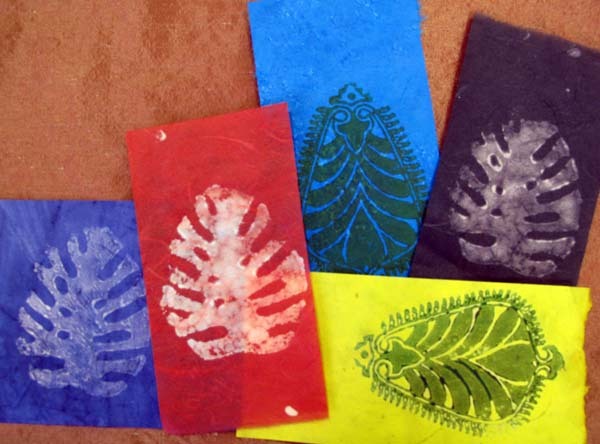 Place your paper or fabric on a foam printing mat, then press the wooden printing block firmly onto the surface to transfer the deColourant. 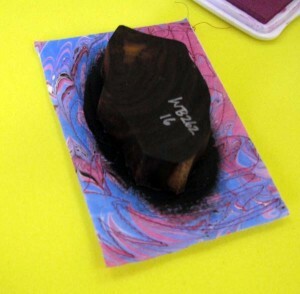 I did find that the sponge did not work as well with deColourant as it does with Fabric Paint. 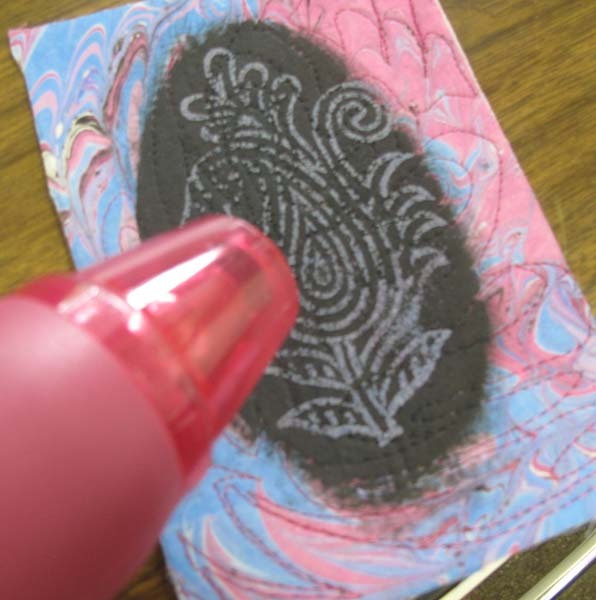 We tried a fan brush during our class and got better results. 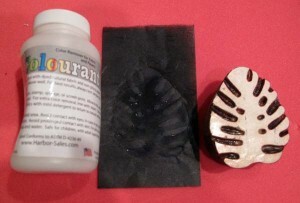 Using deColourant, you will find that some dye colors discharge to lighter versions of the original color (like a pale pink from red), some turn to a different color entirely (black fabric and paper is known for this surprise; you can see it discharge to white, or to light oranges, greens and more), and some don’t discharge much at all. 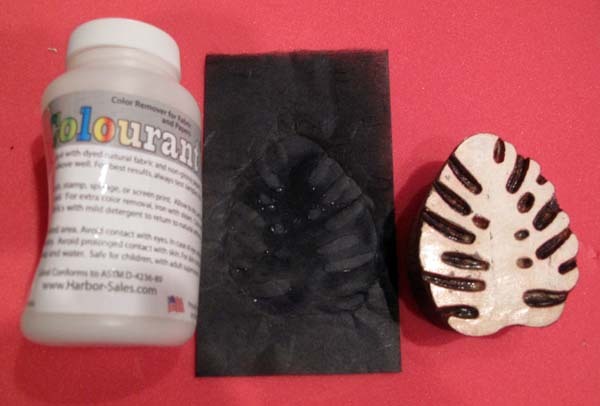 Similarly, the amount of color added by using the deColurant Plus can vary. You have to test and experiment! One of the great features of these products is that they don’t change your fabric or papers in any way: the “hand” of your surface remains unchanged. 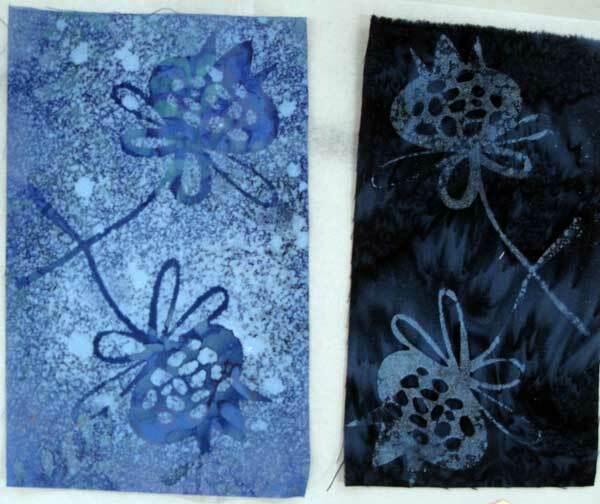 deColourant works exclusively on the color dyes that are in the fabric and paper, removing in an easy, one-step process. As I had noted, I hadn’t previously tried deColourant on paper, so the results of that were fun to see! Join us for next month’s “How Do I Use This?” session on Thursday, July 10, 6:30 – 8:30 pm — we will be experimenting with Gelatos! Bubble Wrap will go down in History as the best stamp ever! When printing with wooden print blocks, it is one of those tasks that is better done without an end result in mind… at least that is how I feel. 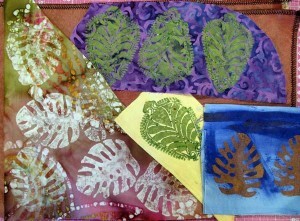 Just enjoy creating fabric, stamping patterns and have fun! 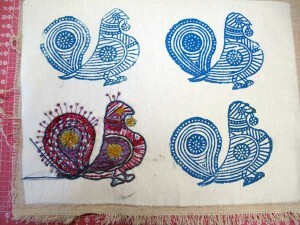 I printed two pieces of fabric with wooden printing blocks, which are hand carved in India, using PROFab Opaque Textile Paint. The first bird is stamped on plain white muslin, while the owl has been printed on a watercolor batik. 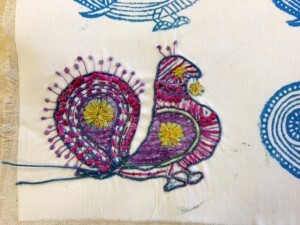 Inspired by Ruth Chandler’s wonderful book, Modern Hand Stitching I decided to stitch over my block printing with Tentakulum Painter’s Thread. In preparation for hand-stitching, I took the fabric, applied Mistyfuse to the back, and attached it to a light weight flannel or Osnaburg. The Mistyfuse prevents bearding of the quilt batting, while the thin flannel keeps the quilt thin. 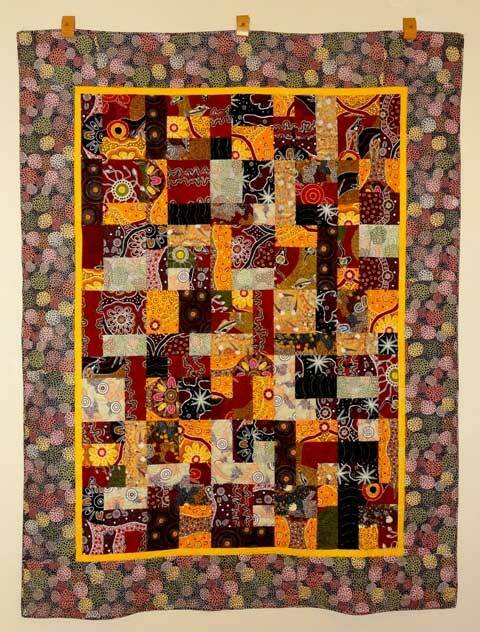 The completed stitched block can be layered over quilt batting and backing to finish. 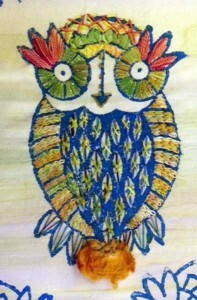 My idea is to use different stitches and Tentakulum threads on each owl. 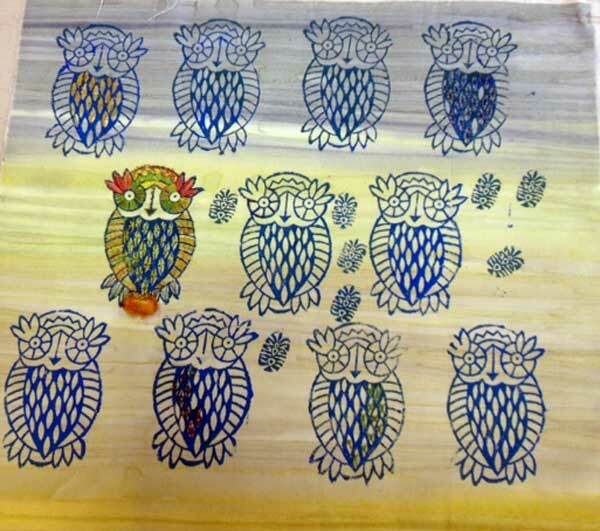 But those honeycomb owl bodies scream cross stitches! Close up of the Hand Stitched Bird. One completed, two to go. I will probably leave one bird as a printed/stamped image only. As you can see, these stitching experiments are still a work in progress. 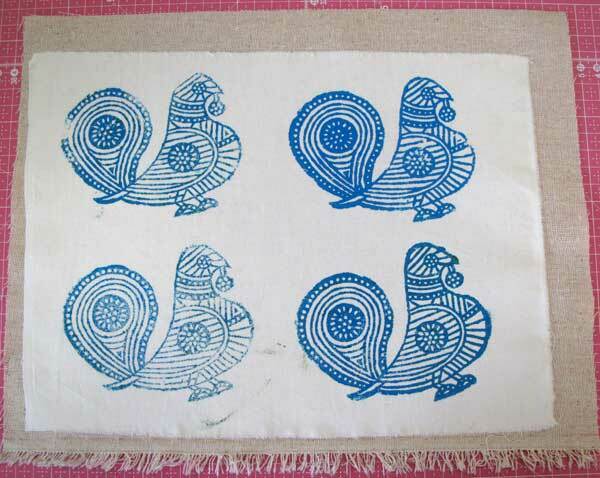 But I am enjoying working on them, and I think that the end result will be that these fine-feathered fowls will find their way into art quilts! For the next inspiration, look at your fabrics monoprinted with your Gelli Arts™ Gel Printing Plate and those surface designed with stencils, such as the example shown at the end of this post. Do the shapes and colors inspire you to pick up some thread and begin stitching? Memento Ink Pads + Wooden Printing Blocks = Fun! I’ve stated this many times so far in this blog, and here is it again: I am a fabric girl. I am continuing to learn about using paper, and enjoy it, but fabric is my go-to medium. So with that being said, I am pretty fearless using products on fabric that aren’t meant to be used on fabric. But I will I jump right on it when a manufacturer takes care of the testing for me, and states up front that its product is FOR use on fabric! 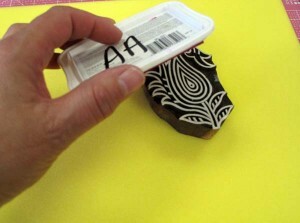 That is the case with Memento Luxe Mixed Media Ink Pads (see more about them at the end of this post). Memento Luxe Mixed Media Ink Pads are made by Tsukineko, which the first manufacturer that I knew of that created inks that were permanent on fabric when heat set. At that time they came in a marker form. Now we have ink pads! 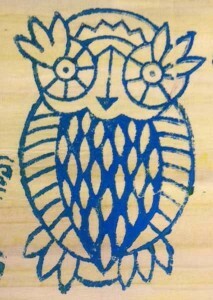 Next enter wooden printing blocks — limitless fun in pattern form! My current stash of various types of ink pads had never worked with wooden printing blocks: the wood sucked up the ink too quickly, leaving either nothing to be transfered to the fabric, or such a faint and uneven print that it wasn’t suitable. A friend suggested that I try Memento Luxe Mixed Media Ink Pads with my wooden printing blocks and it works beautifully! I was thrilled with the results of just ink on fabric. 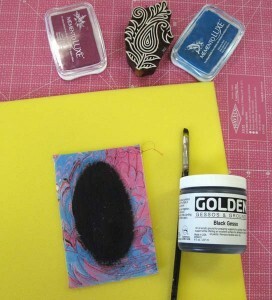 But because these inks are very “juicy” I was able to add embossing powders for texture. (Told you, I’m all about using non-fabric products on fabric.) I’m hooked! I had some Postcards fabric collaged and ready to go. 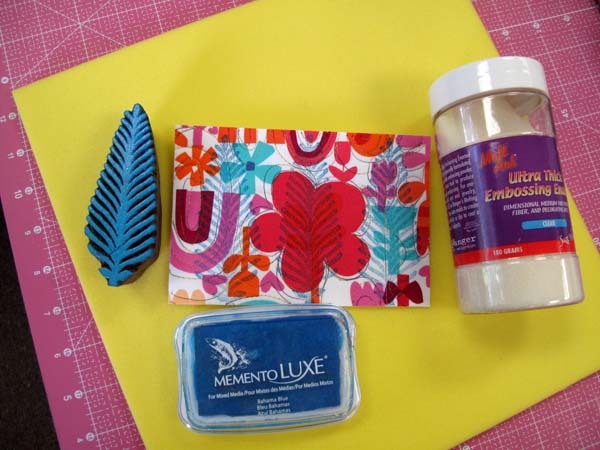 The Memento Luxe Mixed Media Ink and embossing powder is very cool, but what if I want to keep the color of the ink? Enter clear embossing powder — I used Melt Art Ultra Thick Embossing Enamel (which is also available in five colors). Below is a swatch print of my new favorite paisley wooden printing blocks. 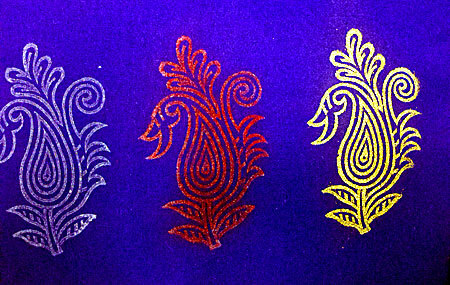 Each of the three prints began with white Memento Luxe Mixed Media ink: left is the print alone, center is topped with Tim Holtz Distress Embossing Powders in Fired Brick (these are a little softer in color and texture; after you apply and emboss with your heat gun, you rub the embossed element, which releases special crystals to give you a textured, worn and weathered look) and right is topped with Metallic Embossing Powder in gold. 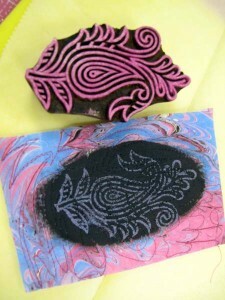 Mixed media ink can be used on any porous surface: paper, fabric, wood, leather and more. NOTE: prize has been awarded So, a bit of a challenge for you: try out this technique to create your own fabric (or paper/cardstock) postcard. 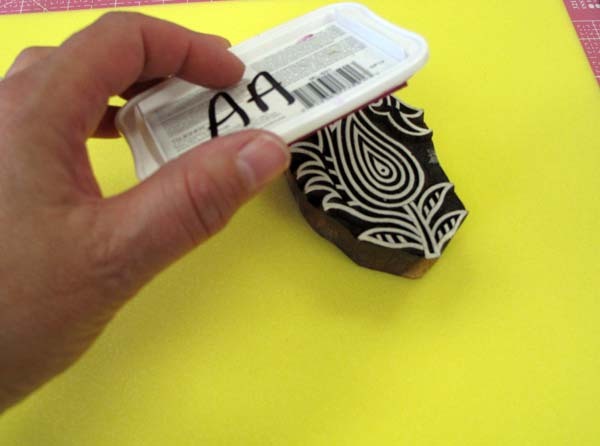 Mail it by June 14, 2014 to me and your name will be entered into a drawing for a Wooden Printing Block! My choice, your sweet surprise! Visit Me in Hampton, VA! I’m on my way to the Mid Atlantic Quilt Festival! The show opens on Thursday, February 27 and runs through Sunday, March 2 and takes place at the Hampton Roads Convention Center in Hampton, VA. This is the 25th Anniversary of the Festival so I’m hoping for a crowd! I know a lot of my quilting colleagues from the various Quilter’s Unlimited chapters travel down for this show, which is one of the best on the East Coast, so if you’re attending, please stop by to say hello — I’ll be in booth 1021. I’ve packed a nice assortment of fabric and notions, plus selections from the Batik Tambal side — vintage and new tjaps, batik panels and more. Saturday, March 1, at 10:00 am. Post-SAQA Classes Coming this May! 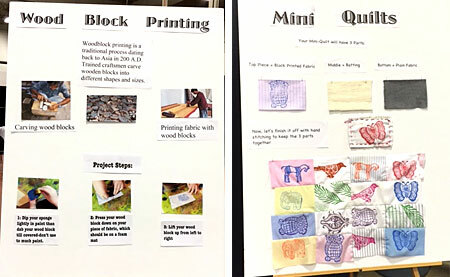 As noted in this week’s enewsletter, this May the Studio Art Quilt Associates (SAQA) 25th Anniversary Conference is taking place in Alexandria, VA, just a few short miles from us. We are planning ahead and have a special week of events and classes planned for May 4 through May 10, following the SAQA conference. My Colorado buddies from Textile Evolution, Liz Kettle** and Ruth Chandler will be visiting Artistic Artifacts again, as will Carol Sloan, a wonderful mixed media artist from South Carolina. 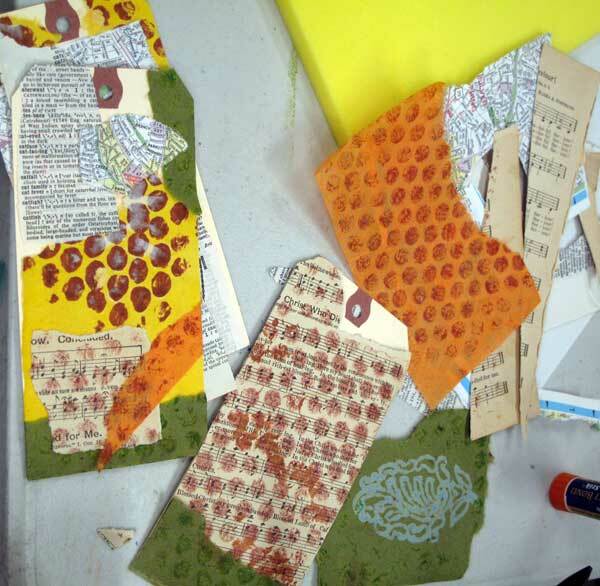 They will join local instructors Cyndi Souder, Susan Gantz and Nadia Azumi for these special post-SAQA classes, which are open to all. Schedule your vacation early this year and enjoy a fiber/mixed media retreat by taking more than one! Many of these classes have already been published with an online registration link, and others will be online soon, so keep checking. Visit both our classes page as well as our online calendar for additional details, and stay tuned! ** Speaking of Liz, take a look at one of her recent blog posts as she shows off her latest creation. 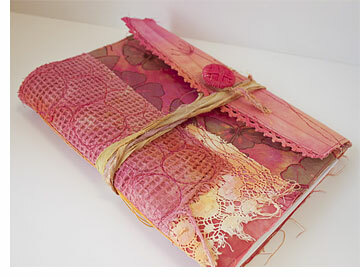 She is teaching a fabric journal class at the Kansas City edition of Art & Soul and designed a beautiful new creation. As she phrases it, one “cure for winter” is gazing at those warm, sunny colors! 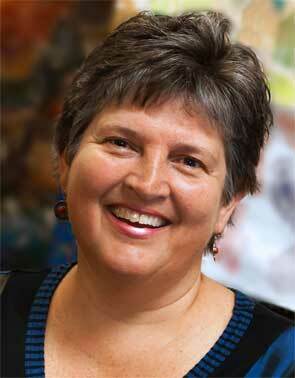 I’m proud to be affiliated with Art & Soul the on-site store for Art & Soul Portland and Virginia Beach! This is one of the original creative retreats (held since 1999) and it remains one of the best. 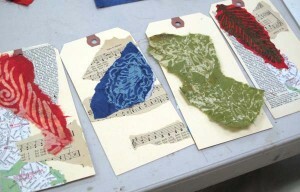 Learn more and register at artandsoulretreat.com.